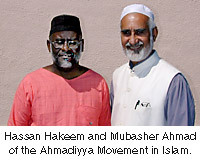 A few months ago I received an E-mail note from Hassan Hakeem of the Ahmadiyya Movement in Islam. The note was an invitation to speak at their Messiah 2000 Symposium which was scheduled for August 11 and 12, 2000 at Carthage College in Kenosha, Wisconsin. A few days later Hassan telephoned me to extend the invitation in person. As Hassan would later tell the audience at the symposium, the first words out of my mouth were, "We have basic, fundamental differences." In spite of our differences (or maybe because of them), Hassan wanted me to speak on the matter of "tolerance" at their symposium. Since the word "tolerance" is widely abused in American society, I suggested that we change my subject to "Tolerance Without Sacrificing Conviction." The brethren here in Zion gave me a great deal of encouragement while I was preparing for the lecture, and many of them attended the lecture in Kenosha. The day before the lecture there was a press conference in Zion so members of the news media could ask questions about the symposium. The one thing that nearly all of the newspapers reported was that the Muslims had not requested to see a written copy of my lecture before I delivered it. This impressed me as well as members of the press. Nearly 2,000 Muslims from around the world were present for the lecture. While some brethren might not like me saying this, I can honestly say I have never had a more courteous audience in all of my life! There were absolutely no interruptions while I was speaking, and I believe the audience was really paying attention to what I had to say. After the symposium was finished I stayed in the auditorium for almost an hour answering questions and meeting members of the audience. Although we are diametrically opposed on so many fundamental issues, without exception I was treated courteously and kindly by all. Many of the attendees were from India and it was a pleasure to discuss matters of theology with them. It is always a pleasure to discuss religion with sincere people. People who really believe they have the truth do not have to get angry when others question their practices. I sincerely hope that some time in the future we can get together again and discuss other matters, such as the Koran and the crucifixion of Jesus Christ and His resurrection from the grave on the third day. Reasonable people can disagree without turning to violence or questioning the honesty or integrity of others. Truth really is narrow, but it will never fear investigation. Tolerance Without Sacrificing Conviction, a transcript of a lecture by David Padfield which was presented to 2,000 members of the Ahmadiyya Muslim Community. The lecture was given at Carthage College in Kenosha, Wisconsin on August 12, 2000. Muslims from throughout the world were present. The lecture gives a partial history of the city of Zion, Illinois and of it's founder, Dr. John Alexander Dowie (PDF file size: 61k).